The great thing about Keurig and their k-cups is that you can make delicious coffee with a press of a button. But here's the punchline: those k-cup pods start to hit your hip pocket after a while, so today we are revealing 5 places where to buy k cups cheap! No one should go broke satisfying their coffee cravings. Below are 5 different places you can get cheap k cups. 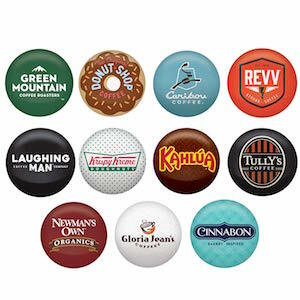 We've included both official k cups retailers as well as third party k cups stores. This is the first place to look to find discount k cups. Not only can you try out a range different flavors from as cheap as 0.25 cents per pod! But you can also set up a "subscribe and save" re-order service that slashes a further 5-15% off the already cheap k cups. Click here to check Amazon's range of k-Cups. Or grab yourself a variety pack below to sample several different flavors. 11 different flavors to try including Donut Shop, Tully's and Kahlua. Comes in a pack of 40, 60, 72 or 100. You can also find both offical and third party k-cups on Amazon. The prices range from 0.25 cents to 0.60 cents depending if they're Keurig branded k-cups or not. Below are some of my favourite types. One of the cheapest ways to use your keurig is to buy reusable k-cups. 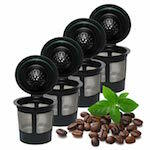 Just buy your own whole greens, grind your coffee with a good coffee grinder, then refill your k-cups. This is by far one of the cheaper ways to satisfy your coffee cravings. It is also very environmentally friendly as you wont be disposing those plastic pods after every coffee. Single use coffee pods and k cups have contributed to a landfill problem. There are a few options available on the market but one of the most popular is this by iparts or the official keurig reusable pod. Comes in a pack of four to satisfy your coffee cravings. Just grind, refill, and drink! Of course it does involve a little bit more preparation time as you will have to refill your pods. If you're looking for a more convenient option its better to go for the normal one-use range. There are several online retailers that have created their own brand of k-cups. Their main point of difference is that they create k-cups made with fresh coffee. This is done by having a shorter grind to package time when compared to bulk coffee providers. Most of the time these retailers also offer subscription services. A good one I recommend to check out is Hiline Coffee. Usually the more you order the cheaper. Also the longer the subscription time the better deal you can get. So make sure you check these out as well. Don't forget about your local Walmart, Costco and Target. These retailers usually offer great discounts when buying in bulk. Often they'll have specials on as well. So make sure to keep an eye out when you do your shopping. This is one of the best ways to get keurig k cups cheapest but only if you keep track of your local deals. If you've recently bought your Keurig don't forget to register it online as you can get 50% off any k cup set through their online store. This is however a limited time offer only good for one discount after registration. So make sure you get the biggest box and save. Although this is a short discount, a deals a deal.